Nine of the first team players from the Rugby League Club surprised lifetime supporter, Wes Trowell, with the keys to his new Ford Transit Custom at their training ground on County Road in Hull. 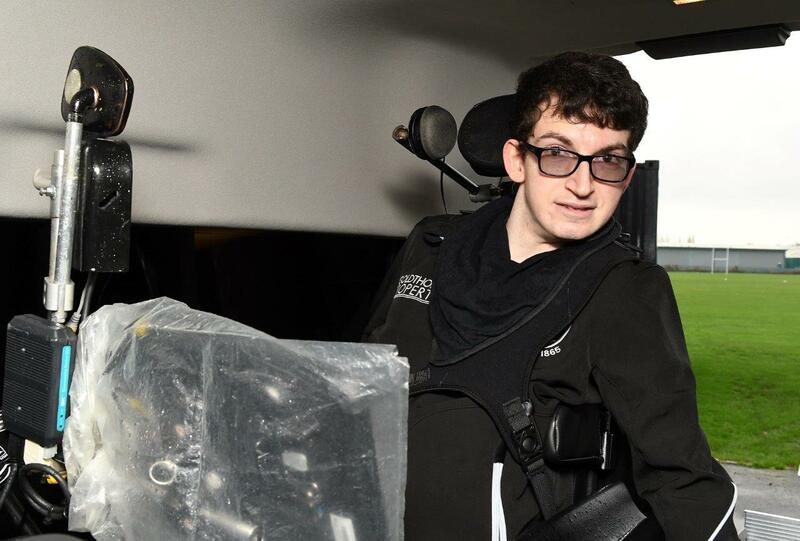 Wes, who has cerebral palsy and needs to stay in his wheelchair to travel, knew nothing about the handover or the finishing touches made to his vehicle by staff at Cartwright Mobility. The Yorkshire conversion company specialises in wheelchair accessible vehicles and driving adaptations, and is an approved supplier on the Government-backed Motability Scheme. The high roof Custom supplied by Stoneacre Ford (York) is fitted with an automatic fixed platform lift, restraints for Wes’s power chair and some extra special touches including the players’ autographs. Hull FC’s first team players signed the interior cupboard door before the handover for super-fan Wes who has travelled as far as New South Wales in Australia to support his home team. The vehicle has a custom paint job in the Club’s colours of black and white with colour coded bumpers, wing mirrors and alloy wheels with tailored Hull FC hub caps.